A Belfast woman says the power of social media helped find her mother who had been missing for more than nine hours. Joanne Mehaffey's mother, Diane, suffers from Alzheimer's Disease, and had gone out just after 09:00 BST on Wednesday to walk her dogs. But by teatime, she had still not returned to her home in the south of the city and her family were sick with worry. Joanne, who was travelling back from Donegal, felt helpless because she could not get a good phone signal, so decided to post an appeal on Twitter and Facebook. She urged her followers to retweet and share the picture message. She tweeted: "This is my mum & she's gone #missing. 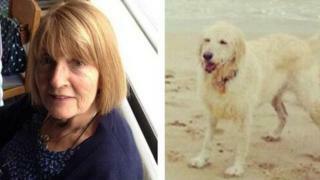 Help try & bring her home safe #missing #belfast #plsRT #alzheimers". Joanne said: "I love Twitter and I love Facebook and I needed as many people as possible to see mum's picture to speed up her being found. I knew I needed to do it sooner rather than later. "While she would not have necessarily wanted everyone to know that she was suffering from Alzheimer's, I needed her brought home, and if that meant I needed to share it, I was going to share it. "I knew that Twitter was a powerful tool. I just needed one person to see her and that's what happened." The message was retweeted hundreds of times - but crucially Lisburn woman Christina McStravick saw it. "I was sitting about six o'clock in the living room, watching TV, and I noticed a woman walking past the window with two dogs," she said. "She seemed a wee bit dazed and kind of caught my attention but I didn't think anything of it. "Literally, 30 seconds later I was on Twitter. I saw that Oscar (Knox) had retweeted Joanne's poster. "I jumped in the car, drove round and drove slowly past Diane. I didn't want to scare her but I realised it was her." She gently coaxed Diane into coming into the house for a cup of tea while her husband rang Joanne and the police. "My husband gives me a hard time for going on Twitter too much, so he can't do that anymore," Christina said. But Joanne has been overwhelmed by the response on social media. "My mother had walked about eight miles. We would never have thought she was there. "My husband says he's a Twitter widow, but Twitter and the kindness of strangers brought my mum home," she said.